This weekend, I came across an interesting post by Benedict Evans on "unfair but relevant" comparisons. While I agreed with everything he said, his focus was entirely on the hardware side of the equation. It may be just as relevant to compare today's hot mobile services to online service start-ups from the PC era. 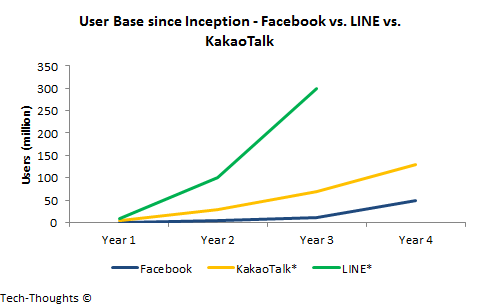 The chart above compares the growth of Facebook's user base, since inception, to that of KakaoTalk and LINE. One disadvantage here is that we can only compare registered users for messaging apps to active users for Facebook. According to one estimate, 61% of LINE's registered users are active. If this proves roughly accurate for major messaging apps, KakaoTalk and LINE would still overshadow Facebook's user growth by a considerable margin. This is because PC-era start-ups like Facebook and Google operated in a much smaller playground as compared to today's mobile start-ups. But the "scale of mobile" has already been beaten to death. Does that necessarily mean that these companies also make more money? Now this is interesting. 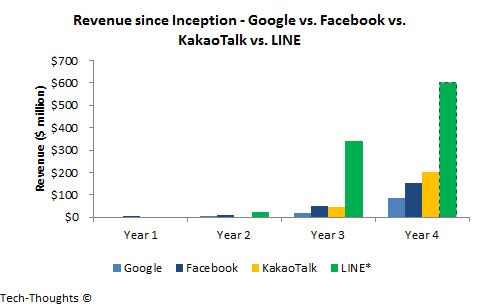 The chart above compares the revenue figures for Google, Facebook, KakaoTalk and LINE over their first four years of operation, starting from 1998, 2004, 2010 and 2011 respectively. Revenue figures for Google and Facebook have been sourced from their respective IPO prospectuses, while those for LINE and KakaoTalk are from company press releases. For LINE, I've taken a conservative estimate for Year 4 (2014) revenues by assuming average quarterly revenues of ~$150 million, 25% higher than its Q4 2013 revenue. In comparison, LINE's average quarterly revenue in 2013 was roughly 300% higher than its Q4 2012 revenue. All revenue figures for KakaoTalk and LINE are net of payments to developers and partners. Over their first four years of operation, KakaoTalk and LINE have outpaced the revenue generated by both Google and Facebook. This is especially significant given that KakaoTalk is still considered a regional player. LINE, while smaller than Whatsapp, is more diversified geographically and dwarfs Google's and Facebook's early revenue performance. As it turns out, the playground isn't just larger, it's also better.